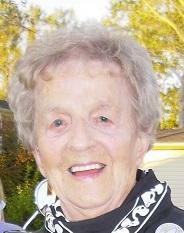 We, the family of Rosalie ‘Rosie’ Marie Carrigan, age 95, regretfully announce her sudden passing on Friday, March 9, 2018 in Owen Sound, Ontario. Born in New Waterford, she was the daughter of the late Martin and Theodosia (Novak) Stepaniak. Throughout most of her adult life, Mom served as caregiver to many of her close relatives who needed her help including cousins, aunts and uncles, brothers and sisters and finally her loving husband who passed away seven years ago. She was a devoted Roman Catholic and a former member of Saint Agnes Parish. Mom is survived by her daughter, Cecilia (Larry) Skinner, Owen Sound, Ontario and her son, Gregory Carrigan (Lynda Moffatt) of Port Hawkesbury. She is also survived by five grandchildren who meant the most to her and who loved her dearly. She had a very special bond and relationship with each of them, Blayne Hemphill, Lisa Beaudette (Dave), Roselle Carrigan (Jason Rohmer), Stephen Hemphill (Krista) and Chris Carrigan (Elizabeth) will forever hold a place in their hearts for their Nan. Mom also leaves behind seven great-grandchildren. Mom was at her happiest whenever someone dropped in for a visit and a cup of tea with “just a little piece of pie” (of course with ice cream). Besides her husband, Augustus ‘Gus’ Carrigan and parents, she was predeceased by her brothers, John and Michael Stepaniak and sisters, Pologia Yost, Helena Nearing, Cecilia Stepaniak, Hughena MacLeod, Dorothy Orr and a sister, Ann, in infancy. She was the last surviving member of her immediate family. Arrangements are under the care and direction of V.J. McGillivray Funeral Home, 380 Smith St., New Waterford. A Funeral Mass will be held at the Parish Church of St. Leonard with burial to follow in Forest Haven Memorial Gardens at a date to be announced later.